We believe the title of the oldest Gurkha in Nepal belongs to Lance Naik Lal Bahadur Gurung. 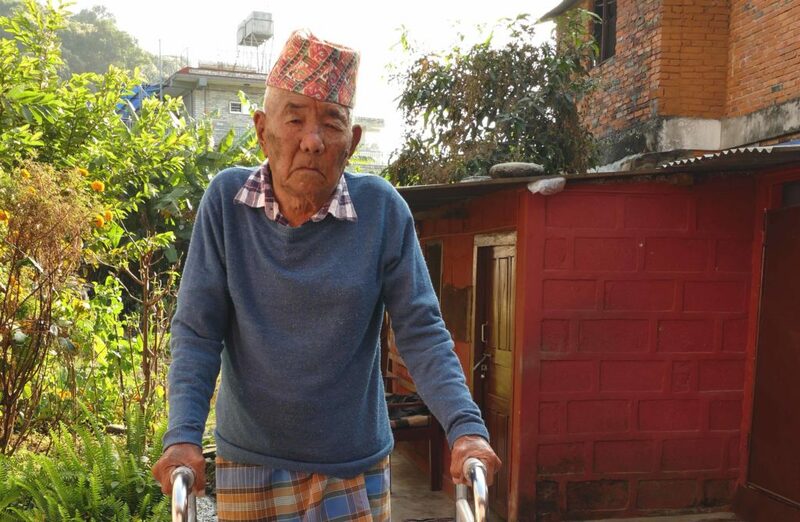 Of the 4,500+ Gurkha veterans and widows we support with a Welfare Pension in Nepal, well over 200 of them are over 95 years old. Lal was born in 1914 and celebrated his 105th birthday earlier this month. The title of our oldest Welfare Pensioner is often up for some debate in our offices. 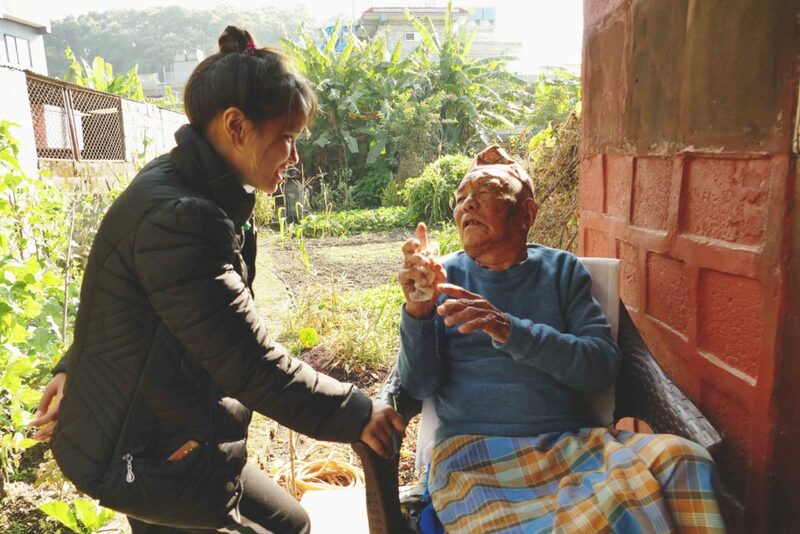 With no official record system dating that far back in Nepal, verifying ages can be near impossible – not to mention the countless Gurkhas who lied about their age to gain entry to the British Army during the throes of World War Two and beyond. Who is Lal Bahadur Gurung? A fiercely proud man, Lal lives just fifteen minutes from our nearest Welfare Centre in Pokhara, Nepal. Though made of just cement blocks and corrugated iron sheeting his home is modern by Nepali standards with good road access, a working toilet, running water and electricity. We met him there recently to discuss his military past and ask him what his secret is for living such a long and fulfilling life. Lal has seven children in total and since his wife passed away in 2011 he has lived with his second-youngest son and his daughter-in-law. He is very grateful for the care and support they are able to give him in his old age. Lal still has an incredible memory for his time in the Gurkhas. His enlistment date is recorded as 11 November 1940. With the world in the throes of a World War, he was one of around 250,000 Nepali men who fought alongside the British. At 26 years old he was over the traditional recruitment age for the Gurkhas but, in need of the numbers, the Army welcomed him. After some brief training he was sent to the front line. “One time the officers told our section (of eight soldiers) to move forward, and so we started running towards the enemy. They [the officers] didn’t hesitate to send our section. They gave us covering fire from behind with tanks. We had to crawl in places and run in others. We were just bait to lure the enemies close. “Soldiers were injured and they were crying and shouting in pain. I saw another Gurkha, he was from the 6th Gurkha Rifles. I called out to him and asked him what time it was. He said its 12:00 o’clock. I told him to get up. He didn’t say anything. ‘The enemies are coming! shoot at them’ I said. He said don’t fire or the enemies will know our position. “I started running. When I finally reached the camp they cheered Shabash (Bravo)! From Libya, Lal travelled to Tunisia where he witnessed similar atrocities. He recalls times of walking behind tanks into packed theatres of war and a time when they captured over 800 German soldiers at once and sent them to camps in India. From Tunisia, he was sent to Italy. 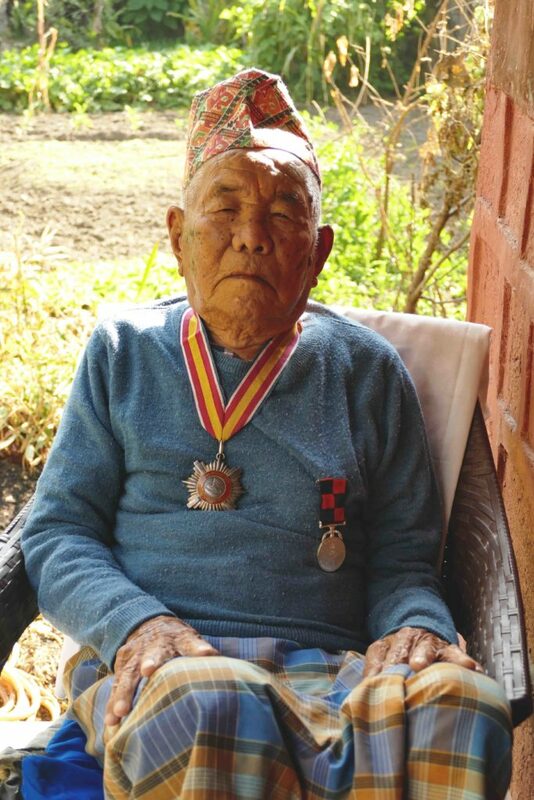 He recalls tales of Gurkha bravery in the face of almost certain death. Talking this month, Lal is upset about his treatment by the British Army once the war was finished. During his tenure in the Army, he served for seven years across over ten different countries. At the time, fifteen years’ service was required to receive the British Army pension. Though returning to life in Nepal was difficult, unlike many of his comrades, he was able to forge a living to support him and his family. These days he relies on our Welfare Pension to survive. He’s incredibly grateful to the Trust’s supporters for the care he receives. As well as the financial support we’re able to provide him, he also gets regular visits from our medical team to ensure he has the medication he needs. “It’s like this. First, I don’t drink, I don’t smoke, I even don’t drink tea. I don’t eat whatever I get given. I drink milk, I sometimes eat meat, I eat lentils. I am aware about diabetes so I don’t eat sugar. I don’t eat too spicy food.